Set yourself up for the day with a hearty breakfast. Edinburgh Suite We’ll limber up for our assault course challenge at the Playpark. After that we can have a wander round the gardens. Edinburgh Suite Unleash your inner creative side. The craft area is open every day for all ages to pop along to. You could make something festive, or do a self-portrait, or decorate things. Meet at Cherub Pizza, the way you like it. You choose what toppings you’d like and how you’d like it to look, then it’s off to the pizza oven to cook. Enjoy! Have a little or a lot, the buffet is now open. How about a hand massage or nice newly polished nails. We’ll be in the lobby offering these mini express treatments. Sign up for the ultimate family challenge. Remember points make prizes! If the weather is rubbish we’ll move indoors for this activity. Come and sample some of our favourites and learn a bit more about them. Relax in the Regency with a movie and popcorn. Lots of splashing and having fun – it’s compulsory! Enjoy a meal from our freshly cooked buffet. A lovely way to start the evening, a warm welcome from the Hydro team and some music from Andy Lucas. Good food, good company and best of all no dishes! You just need to book your table and leave the rest to us. Edinburgh Suite You’ll have to follow the clues to find the hidden Hydro treasure. We hear it’s hidden inside and out, remember to bring your coat with you, we’ll give you some torches. Our chickens love to see a friendly face, you’ll find out some interesting facts and how many eggs they’ve laid today. Let’s get into the festive spirit with a Christmas carols sing-along. A traditional evening of Scottish music and dancing. Not tried it before, don’t worry our band will take you through the steps. Take a break from all that unwrapping presents and enjoy breakfast. Last chance to see Santa before he heads off for a welldeserved rest. Join him and his elves for some fun and games before he goes. The craft table in the Edinburgh Suite is open every day for you to pop along to. Join us in the Lounge to say cheers to Christmas before lunch. Remember to book your table in advance, then leave the rest to us and enjoy a delicious traditional Christmas Day lunch. Her Majesty addresses the nation with her festive wishes. Work off your Christmas lunch splashing around in our pool. Test your knowledge with our festive quiz. Fun for all the family. Fancy yourself as a table tennis champ? Sign up for the tournament to show off your skills. There’s lots of games to play in Not The Cocktail Bar. Grab a seat and let the games begin. Sign up and get your cue chalked. Who will be the Hydro Cup winner? Enjoy some super food from the buffet. 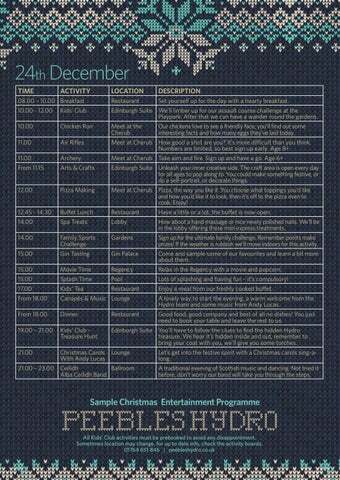 Christmas songs, games, stories and prizes in the grotto. A great way to relax after a busy day, listening to Andy is the perfect end to a lovely day. Start the day off with a hearty breakfast, just perfect to keep you going until lunch. Edinburgh Suite We’ll go outside for a wander and a bit of den building today. Remember to wear suitable clothing and footwear. 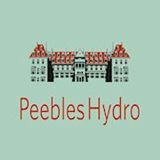 Meet at Cherub Pop to Peebles Hendro and tell our feathered friends all about your Christmas, they will be so excited to hear from you. Edinburgh Suite Have a relaxing time pottering about in the craft area, maybe make some souvenirs to remind you of your Christmas in Peebles. Carvery roast with all the trimmings, just book a time that’s good for you. We’ll be in the lobby offering some mini express treatments. Meet at Cherub Find out more about the Hydro Hop House – the home of Freewheelin’ Brewery. Meet Richard the man behind the brewing. Remember to sign up for this activity. Let’s shake things up a bit. We’ll show you how to make (and taste) some classics. Fun and games – just grab your swim stuff and head for the pool. Daily movie being screened in the Regency. Have you got what it takes to win the tournament, sign up to take part. Workout time for the brain, here’s a challenge to really get you thinking. Choose from our freshly cooked buffet. Pre-dinner piping and nibbles in the Lounge. Let the festive feasts continue - just let us know a time that suits. Edinburgh Suite Music night – do you fancy yourself as a bit of a musician. Let’s make some noise tonight. Outside for some fresh air and challenging games. Sign up your team and get ready for the competition. You should be ceilidh pros by now! Another chance to whizz around the dance floor – it’s a great workout. There’s lots to choose from at the breakfast buffet, the full Scottish or continental. Cake decorating today, bring lots of ideas. Go visit the chickens at Peebles Hendro. Remember to wear your outdoor clothing and footwear. Lets get crafty, the arts & crafts area is open until 18.30. A place to relax and be creative. Pizza, the way you like it. You choose what toppings you’d like and how you’d like it to look, then it’s off to the pizza oven to cook. Enjoy! We’ll be in the Lobby offering some mini express treatments, how about some nice polished nails or a hand massage. Follow the clues to find the hidden treasure, both inside and out. You’ll need your coat and outdoor footwear, we’ll give you a torch too. Splash about and have lots of fun in the water. Buffet tea, no parents allowed. Remember to book your table for dinner. That’s all you need to do, we’ll do the rest. Let’s go outside for a bit for some hot chocolate and marshmallows. Then back inside for some music and games. Go for it with some great music and dancing.